Whole Black Summer Truffles...prized by mushroom lovers! The unusual flavor of black summer truffles is pervasive...a subtle taste & sweet, "chocolatey," musty odor, prized by connoisseurs. Whole black summer truffles are the best known underground fungi due to their reputation for excellence in many cuisines. Black summer truffles are found not only in France, but in Italy & Spain. Truffles are also found in North Africa, in the Middle East, & in North America. White truffles from Alba, Italy are also highly prized. White truffles from Oregon are gaining in popularity..."James Beard claimed that the Oregon white truffle could be substituted for European varieties." Black truffles are a challenge to forage in the wild...in non-native habitat they have not yet been successfully cultivated in large quantities. 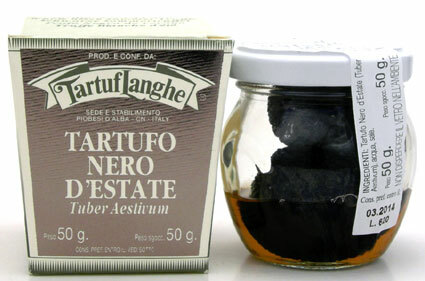 Whole black summer truffles...use sparingly! Black summer truffles work best in delicately flavored dishes. Whole black summer truffles can be pureed, shaved or sliced. Black summer truffles are delicious in soups, shaved over pasta dishes, risottos, or chopped & sauteed for flavoring in cream sauces using white wine or champagne...simply enjoy a rare & delicious funghi. Whole Dried Black Summer Truffles.